The HTC First will not be coming to the UK, at least for some time, with confirmation that pre-orders will be taken down on the customised Facebook/Android handset. An EE spokesperson told TechRadar that the decision was to allow Facebook to add new customisation features to Facebook Home "over the coming months". "While they [Facebook] are working to make a better Facebook Home experience, they have recommended holding off launching the HTC First in the UK," said EE. Facebook then confirmed this to TechRadar, telling us that it wants to "limit supporting new devices" while it works on better customisation for Facebook Home. However, while this sounds temporary, a source speaking to Mobile News said the phone "will never go on sale in the UK", despite EE already bagging the rights to sell it exclusively at first. The little birdie added: "Sales in the US were poor and Facebook has taken the decision not to give it a more widespread release." Engadget has also confirmed the cancellation with its own sources. 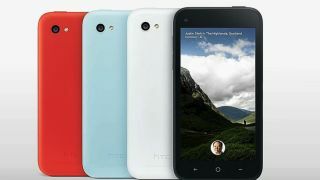 The HTC First went on sale in the US on April 14, and was expected to arrive in the UK within the next few months. However, much like the source reiterated, the phone hasn't been off to a great start given what we've heard so far, with AT&T said to be stopping carrying the handset in the US due to disappointing sales.